You are currently browsing the tag archive for the ‘trade unions’ tag. Who Fears to Speak of Lockout Week? A member of UB1913 reports on the series finale of their podcast series as aired on NEARfm. This past Monday(26 August) marked 100 years to the day of the commencement of the great Lockout of 1913. While official commemoration events are planned for this weekend. for the day that was in it, RTE that evening screened a special episode of Nationwide. The first half of the show fittingly featured the beautiful commemorative Lockout tapestry being put together by volunteers with the help of artist Robert Ballagh. The second part, however, championed the owner of a small chain of curtain stores of the time who “bravely stuck his head above the parapet” and refused to join in the bosses’ lockout. With much fawning, the segment praised his efforts to bring the two sides to the negotiating table. Apparently, it was to his eternal credit that he disagreed with the other bosses literally starving half the city to break the union..! Only the anti-worker establishment could take the momentous and infinitely political story of new unionism(aka “Larkinism”) in Ireland – in its apex of the great 1913 Dublin Lockout – and sideline the self-agency of the working class in its most epic moment. The story of Larkinism and the Lockout is one of direct, brutal class struggle between the workers of Ireland and the bosses of Ireland, not the embryonic corporatism of social partnership advocated by RTE in their chosen micro-history. Expecting this obscuring of the workers’ story by elites; a small group of young unemployed, students, precarious workers(and combinations thereof) got together at the beginning of the year to form the 1913 Unfinished Business collective with an aim of countering the neutering of our history by elite commemorations such as the RTE Nationwide episode. Instead, we seek to make prominent our history of radical struggle, which we believe is incredibly relevant with the return of white-hot class war being waged from above by bosses on the working class of Ireland since 2008. By drawing on the real inspiring events of the Lockout period and stories of the likes of Jim Larkin, James Connolly, Rosie Hackett, Constance Markievicz and others – we recorded a podcast series, culminating in the series finale released on Monday(embed below). We hope by using our incredibly rich past to talk about the present, we can locate its contemporary relevance to inspire young people in particular to preach Larkin’s “divine mission of discontent” in future. Stay tuned. 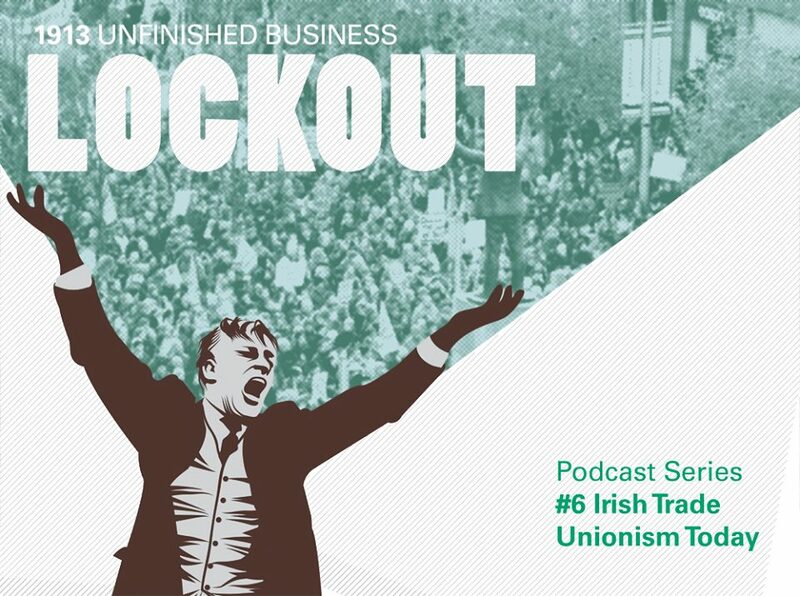 In our final episode of the 1913 Lockout podcast series we look at how workers can organise today to meet the challenges we face.We take a critical look at the state of the Irish trade union movement today and explore what needs to be changed. We speak with Joe Carolan, Organiser with Unite, on his experience with organising Fast Food Workers in New Zealand and hear from Esther Lynch, Legal and Legislative Officer ICTU, on the legislative framework for Irish trade unions. Derek Keenan, chair of the ICTU Youth Committee, speaks to us about what the trade union response has been to Job Bridge and Kieran Allen, Lecturer and Shop Steward, addresses the history of social partnership. This episode also takes a look at a form of community unionism as advocated by the Italian Marxist Antonio Gramsci. The series concludes with group discussion on the need for a reinvigorated mass movement of workers to fight back against bosses, and where to go from here. Contributors: Moira Murphy, Pádraig Madden, Ronan Burtenshaw, Shane Fitzgerald, Eoin Griffin, and Jen O’Leary. Music by Lynched & Lawless. – Aidan Rowe discusses UCD’s Disaffiliation from the Union of Students of Ireland, its implications for the student movement, and whether there actually is a student movement in Ireland . It is something of a paradox that leftists – those progressives who fight for a radical restructuring of society – often end up adopting antiquarian positions that, viewed from the outside, appear bizarre and irrelevant to present-day struggles. 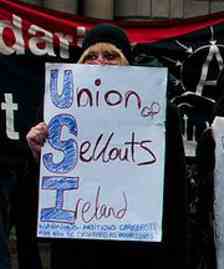 This has certainly been true of left-wing students’ positions on the Union of Students in Ireland (USI) for some time. We understand more keenly than most the historical importance of trade unions, which leads to the adoption, often without much debate, of a moralistic pro-USI position based in an abstract pro-unionism: one which loses sight of why leftists engage(d) with unions in the first place. We feel morally obligated to beat our heads against that particular brick wall regardless of the outcome, and then wonder aloud why more students don’t wish to join us in this particular form of Sisyphean masochism.